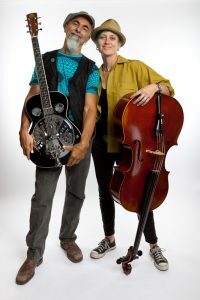 When long-time Toronto indie-scene bassist Jen Gillmor picked up the cello and joined forces with the newest creative incarnation of award-winning blues musician Dennis Gaumond, Jennis was born. The duo tickles ears with an uncommon sonic blend of vocals, electric, acoustic and resophonic guitars, custom-tuned harmonicas, cello, didgeridoo, flutes, jawharp and percussion. Songs celebrate the mysteries and poignancies of life, rooted in a faith in peace and love as the highest powers. Their unusual rootsy sound is at times bluesy, at times funky, jazzy or folky, with a hint of exotic ethnic influences.